Discussion in 'Star Wars' started by Rameana, Oct 22, 2005. I was sitting down going through my lightsabers and I noticed that the two movies spawned some different lightsabers. Like why is the electronic Mace Windu lightsaber for ROTS different than the one he carries in the movie. I mean the cheaper costume lightsabers are more true to his real lightsaber than the ROTS one. Also- is the Anakin ROTS lightsaber the same as his ATOC clones one (AKA Luke's 1st Lightsaber)? Because I can't tell right off and it just looks abit different than the one Luke carries. (I'm talking about the ROTS electronic lightsaber that has just been released). I dont know about the electronic lightsaber of Mace Windu...If it's different...but the one of AOTC and ROTS is the same. Anakin's lightsaber is certainly not the same as in AOTC. The one of AOTC looks a lot like Vader's actually from ep IV. 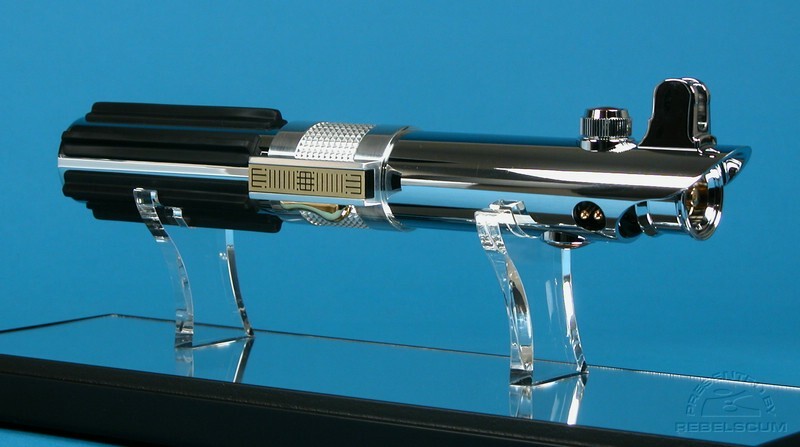 Although looks longer in scale to make it more elegent and with a metal top and not a black one to make it more "light side". The one he has in ROTS is suppose to be Luke's yes, but there are some differences. Again on scale it looks longer. I guess the differences were made because you don't really see Luke's from really close I guess. The activation button is now gold with a laser patern in it. The one of ep IV more had kinda like these plastic bubbles on it like the one Anakin has in AOTC. there was a metal clip next to the activation button in ep IV. But now they replaced it with a gold-coloured shape. What its purpose is...I don't know lol. Doesn't have anything to do with that...he never got that half piece back...was lost on geonosis and he made a total new one. Thanks for that. I knew the ROTS vs. ANH/ESB Lightsaber was abit different. Because those bubbles made all the difference in the world to me. I was asking because I really don't feel like buying multipule sabers. Mace's I'm still unsure about because it's WAY off and WAY different (ROTS electronic is no where near a close replica). It's like a completely different lightsaber only think in common is that the blade is purple. The box is marked Mace Windu wi/ him on there- but it's not his lightsaber. So I guess I'll buy a cheap $7 that's more his lightsaber. Obi-wans is different as well- like the AOTC is his Episode I lightsaber (since they did not release his electronic one with Darth Mauls and Qui Gon's. I have SO much to catch up on, because they sold all of these right from under me. Mace's I'm still unsure about because it's WAY off and WAY different (ROTS electronic is no where near a close replica). It's like a completely different lightsaber only think in common is that the blade is purple. The box is marked Mace Windu wi/ him on there- but it's not his lightsaber. It sounds like you are talking about the Hasbro version and not the MR version. MR copied the design used for Mace's saber from AOTC and ROTS. However, for some reason, the Hasbro (part no. 84966 and 85411) toys show a Darth Maul hilt (at least the blade is purple). I have no idea how or why this happened. Even the ROTS release (#85411) has the Maul hilt. Actually the electronic hasbro lightsaber is Mace Windu's lightsaber from episode I, he does have another one in ep II and III. The one plated with gold. That is a mistake Hasbro made. Thanks for that. I knew the ROTS vs. ANH/ESB Lightsaber was abit different. Because those bubbles made all the difference in the world to me. 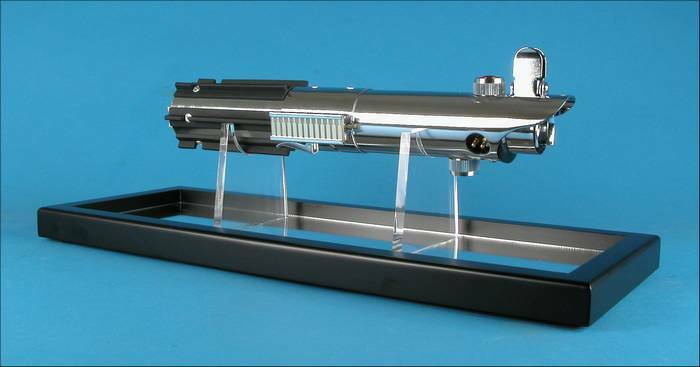 I was asking because I really don't feel like buying multipule sabers..
Well, the main differences would be that the Luke sabers from ANH and ESB are made from Graflex vintage flash guns with grips and greeblies attached. The differences between those two being that the ANH has 7 grips and calculator bubbles in the clamp. The ESB has 6 grips, held down with rivets, a circuit chip in the clamp, and a second red button added to the bottom of the saber in place of the Graflex eye. 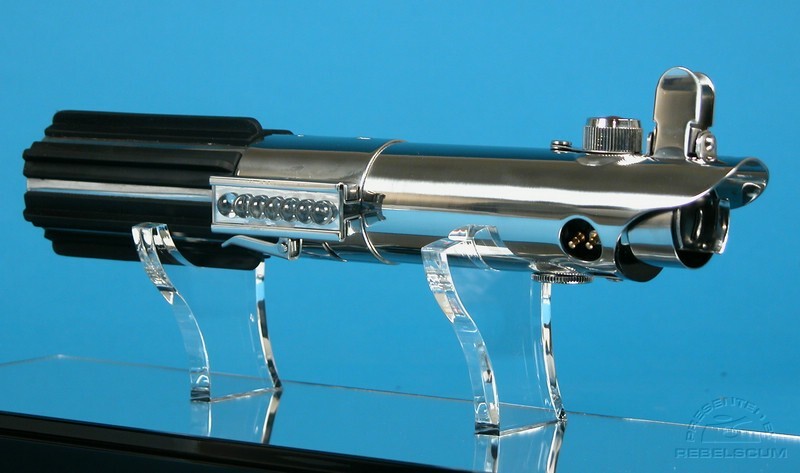 Anakin's ROTS saber was completely custom machined to look sort of like a Graflex flash gun. But when compared side by side there's a lot of differences. Since it is custom machined the clamp, bunny ears and "emitter" are different. The clamp has an actual knurled textured machined into it instead of the textured tape used in ESB. The cosetic differences are that the eye and button are a copper color, there's a custom circuit board in the clamp, the lever is gold plated, and the end cap is machined with a raised ridge texture. If I get a chance I'll take pics of my MR Anakin ROTS next to the Graflex I converted in an Anakin ROTS. Then you can see the differences, at least, between the flash gun and the machiend version. So really if you want a Luke saber and an Anakin saber you have to buy 2 as they are not the same.